Another good month for links in November means that we will most likely be surpassing the number of review links that we have had for previous years of the Historical Fiction Reading Challenge! Amazing! Thanks to everyone who has contributed to the success of the challenge! The challenge will be happening again next year. Keep an eye up for the sign up post soon. It will have a similar format to this year so hopefully you will have all enjoyed your reading experience so much this year that you will be wanting to join in next year again! If you haven't already signed up for this year's challenge, it's not too late! (Well, it probably is but maybe you have lots of reading time during December!) The sign up post is here. 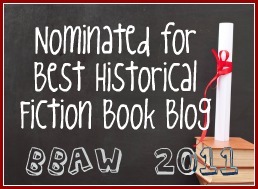 Glad to hear you're hosting the Historical Fiction Challenge again next year. It's fun to post my reviews and read about what others are reading in this genre.